As promised, here's the continuation of my post for Casa Corazon. Casa Corazon is more than a resort away from the city. It has an ancestral home, aviary and surprisingly, a car and motorbike museum. Nature, vintage stuff and those toys for the big boys? It doesn't sound like the ideal collections that match, but Casa Corazon made it happen. The pictures will tell you what to expect in Casa Corazon. Casa Corazon has an extended and well-maintained garden. Can you see the houses that enclose the garden? Each house contains the owner's marvelous collections. The next pictures will give your eyes a treat of the owner's EXPENSIVE collections. This was already enough to mesmerize me. The room is quite big but it tends to look smaller because of the owner's overflowing collections. Even the floor has a theme. Woot! Woot! Look what do we have here. A room full of BMW bikes! According to some of my reliable male colleagues, some of the bikes existed even before WWII. How about that? This BMW with side car existed way before my parents were born. The fact that it's BMW, it's already expensive. I can imagine the thousands to millions of money spent to transport this piece of priceless treasure here. I've never seen a BMW in orange. Bike overload? We're not done yet. Let's move on to the vintage cars. Still part of the owner's property, how about that? I thought Casa Corazon ends in these garden and museum. There's another gate that led us to another surprise. Can you see the mansion up there? I believe this is where the owner usually stays. The gate will lead you to a long trail. 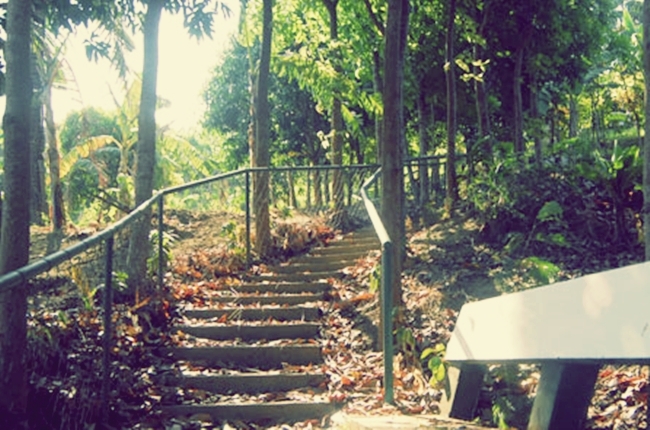 The trail ends in a hill that provides a spectacular view of the owner's property and the shores of Batangas. Would you like to own and spent your retirement years to this place? Casa Corazon also boasts its own aviary. However, I failed to take decent photos of the owner's rare collection. I had issues with the wire of their cages. Hence, these lousy pictures. That's it for my blog post for Casa Corazon. The views are beautiful Diane. As for the collections, WOWZA! Simply amazing. Loved seeing all of it! Oh wow. I have never been to a place like that, where it is a massive collection of things by a private owner! What a nice place to visit, I love the Casa, it is a beautiful home. And the grounds and landscaping are lovely. They do have some amazing collections. The motorbikes are cool! Thanks for sharing your tour. Have a great weekend! WOW. nice collection. never knew this place exists til i read your entry. thanks! Wow, what a fun and interesting place! I know so many people who would go crazy looking at this collection of vintage motorcycles. My husband would probably have to drive one of those Corvettes out of there:-) Thanks for sharing Diane. I do love your travel adventures. That place must have acres and acres of land to accomodate all those treasures. The cars are wonderful!